Home anelka domenech evra football france mexico south africa world cup French Fiasco - Is there hope for the future? France’s humiliating World Cup finally came to an end yesterday afternoon, following an embarrassing defeat against the host nation, South Africa – a team ranked 74 places below them in the FIFA World Rankings. However, it was not simply the results that caused such outrage back home in France – it was the antics of the squad, and the almost soap-opera nature of the news emanating from the French camp. France’s place in the tournament came about through the controversial Thierry Henry handball against the Republic of Ireland back in November, but having scraped into the tournament, France hoped for a strong showing. However, despite having a number of top quality players, public expectation was low, mainly due to a complete lack of faith in the coach, Raymond Domenech. 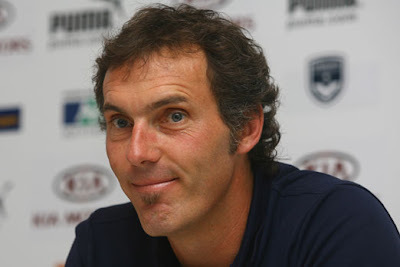 It had been announced before the tournament even began that his record reign as national coach would end after the tournament, and that Laurent Blanc would be replacing him. Whether announcing this before the tournament was a smart move is questionable though, as it seriously undermined his authority in the squad. Even before the tournament, France’s hopes suffered a blow as their warm-up was punctuated by underachievement and poor performances. A narrow 2-1 victory over Costa Rica was followed by a 1-1 draw with Tunisia and an abject 1-0 defeat to what was in reality, a second-string China side. The tournament began with a dull 0-0 draw against a strong Uruguay side, which, despite the poor performance, wasn’t a hugely disappointing result. However, a 2-0 defeat against Mexico followed, which started the farce. Domenech was called a “son of a whore” by Nicholas Anelka during the Mexico game, and following Anelka’s refusal to apologise for the remark, he was sent home. This action caused chaos, with the players making a stand and refusing to train. Domenech was forced to read out a statement from the players, criticising the decision to expel Anelka from the squad. However, Domenech stood firm on his position. When they finally restarted training, a fight between fitness coach, Robert Duverne, and captain Patrice Evra threw the squad back into chaos. The President of the French Football Federation, Jean-Louis Valentin, resigned over the fiasco, whilst the national team have been dropped from a number of advertising campaigns back in France. Furthermore, they appear to have lost public support, with 81% of the population believing that they were incorrect in going on strike. A number of prominent sporting figures in France have also criticised the side – “It’s intolerable. It’s not at all professional,” said former midfielder Emmanuel Petit; “Nobody has any authority over the French team any longer, and that’s serious,” said Bixente Lizarazu. Most importantly, Zinedine Zidane slammed the decision of the side not to train. Zidane is still seen as an almost God-like figure in French football, so his verdict is damning for the side. Defeat to South Africa followed, and the team fly home now, relegated to economy class, and facing an investigation back home, started by Sport Minister, Roselyne Bachelot. Patrice Evra has announced that the squad has no intention of accepting their bonuses from the tournament, in an attempt to help stem the public discontent. Raymond Domenech concludes his reign as coach under a cloud. However, the French downfall has been brewing for many years. They reached the World Cup final back in 2006, but this has predominantly been attributed to the influence of Zinedine Zidane and other senior players, who supposedly called the shots. Since then, things have gone steadily downhill. They exited Euro 2008 at the group stages, and Domenech made a huge public relations error in proposing to his girlfriend live on national TV moments after France had been eliminated. The qualifying campaign for 2010 was hardly an improvement. Finishing in 2nd behind Serbia in their group led to a playoff with the Republic of Ireland, where Thierry Henry’s controversial handball caused uproar. The rest is history. However, he does have plenty of quality at his disposal. 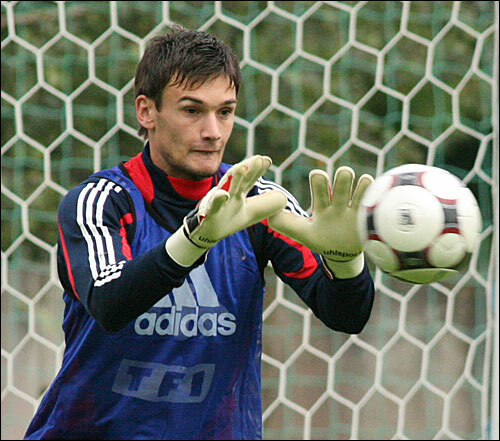 Despite his mistake against South Africa, Hugo Lloris is an exciting young keeper with a bright future. In Patrice Evra and Bakary Sagna, he has two of the best full-backs in the Premiership. However, the centre of his defence needs work. Eric Abidal is not a central defender, whilst William Gallas is arguably past his best. The forgotten Philippe Mexes should be brought back, whilst Julien Escudé and Sebastien Squillaci are decent squad members. The promising young defender, Michael Ciani, who Blanc has developed at Bordeaux, should be brought into the squad as part of the process of building for the future. He has an abundance of talented holding midfielders – Lassana and Alou Diarra, as well as Jeremy Toulalan – whilst Franck Ribery and Yoann Gourcuff provide plenty of creativity. However, he needs to find a way to resolve the rift between the two. The respect that he should command from his players will help – a respect that Domenech never gained. Florent Malouda has refound his form this season for Chelsea, and scored France’s only goal in the competition. The strikers are a problem for France, having failed to score in any of their 3 games. As magnificent a career as he has had, Thierry Henry is clearly past his best and should be jettisoned by Laurent Blanc as part of a fresh start. Nicholas Anelka should be forgiven and brought back into the fold, where the supremely talented, but unpredictable, Karim Benzema is likely to join him. Despite being unimpressive in the tournament, André-Pierre Gignac and Djibril Cissé have a decent case for retaining their spots, whilst young pair, Loic Remy and Kevin Gameiro, have impressed recently and will be pushing for call-ups. 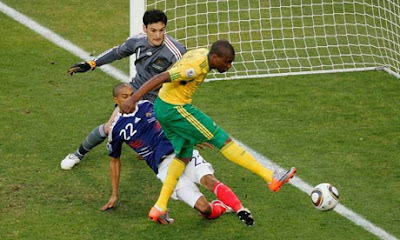 With plenty of talent at their disposal, and a more reliable manager, who does not use astrology as a part of his selection process, France will be hopeful that they can put the fiasco of South Africa behind them, and look forward to a more successful tournament in 2012 in Poland and Ukraine.